In a compelling series, presenter Síle Nic Chonaonaigh explores four of the world’s most iconic walls and borders; the USA-Mexico border, the now demolished Berlin Wall, the Korean DMZ and the Israel-Palestine Separation Barrier. Each episode uncovers the human stories behind these walls, how they affect people’s lives and what happens when the walls come down. We hear powerful stories from people and communities whose lives have been transformed by walls. Stories told by the people who live in their shadow. Those who support the building of walls and those who fight to tear them down. This is a timely series about hope and unity in the face of division, about the triumph of the human spirit in spite of separation. the Berlin Wall and looks at the lasting effect of the wall on its people. how much hope is there for a united Korea. 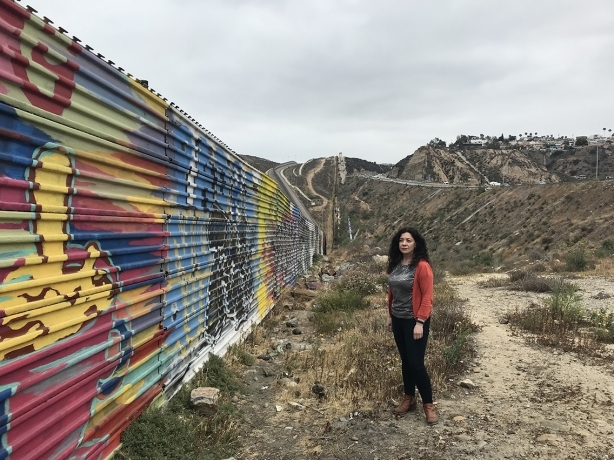 In the first programme in a powerful series looking at some of the world’s most iconic walls, presenter Síle Nic Chonaonaigh travels to Mexico and the United States to meet people living on both sides of this controversial boundary. With 750 miles of barrier already in place, President Trump is determined to build one solid wall along the border that extends for 2000 miles from the Pacific to the Gulf of Mexico to prevent the thousands trying crossing illegally into the US every year. During the emotional journey, Síle meets individuals who are fiercely supportive of Trump’s Wall and hears heart-rending stories from families separated by the wall. A Wall that has divided opinion and divided families. Síle Nic Chonaonaigh's journey continues as she travels to Berlin. The fall of the Berlin Wall was one of the 20th century’s momentous events. 30 years after the fall of the wall meets Germans from both sides who lived in its shadow. She hears captivating stories revealing the sinister world of the Stasi who controlled every aspect of life in the East, and powerful stories from those who risked their lives to escape the Communist regime. In powerful accounts we uncover the cruel tactics of the dictatorship who spied, tortured and imprisoned its people. This special programme offers an unexpected take on the Berlin Wall and looks at the lasting effect of the wall on its people. Síle Nic Chonaonaigh's journey around some of the world’s most iconic walls continues. In this powerful programme she visits one of the world's most dangerous borders between North and South Korea. As well as travelling to the border she visits the capital, Seoul and speaks to Koreans from both sides of the divide. We hear emotional stories of families separated in the melee of war and daring accounts of people who risked everything to flee the repressive regime in North Korea. Many speaking openly for the first time. But now that the first tentative steps towards peace have been taken, Síle asks how much hope is there for a united Korea. In the last in the series presenter Síle Nic Chonaonaigh’s journey our of some of the world's most iconic walls ends in Israel-Palestine as she visits one of the world's most controversial boundaries – the wall that separates Israel and Palestine. In a powerful programme, Síle asks why the wall was built in the first place, visits the hotly disputed Jewish settlements and meets people who have lost their land, livelihood and loved ones because of the wall. During her emotional journey, Síle meets two inspiring fathers who lost their daughters in the conflict and who are now risking everything to speak out against hate and violence, calling on people to lay down their weapons and turn towards peace and dialogue. And calling, above all for the wall, that has caused so much blood loss on both sides, to come down.